Thank you to our fabulous sponsor and all Le Crystelle Clothing and Crafts has done for us. 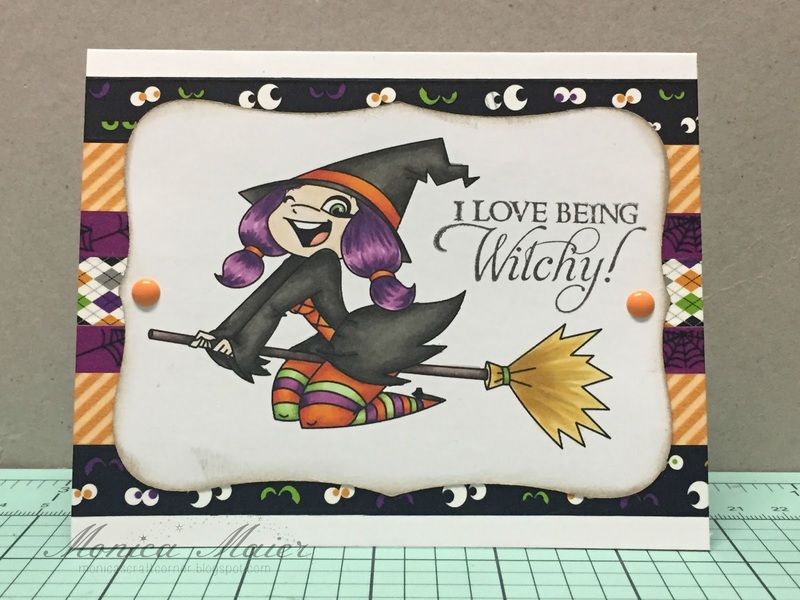 We got to play with the step-cards and wonderful dies or stamps. Be sure to visit our sponsor. 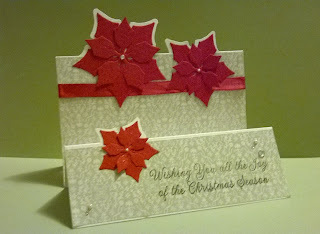 I love the deep red poinsettia against the stark white background. A few little gems and a sticker for the sentiment is all it needed to complete this card. 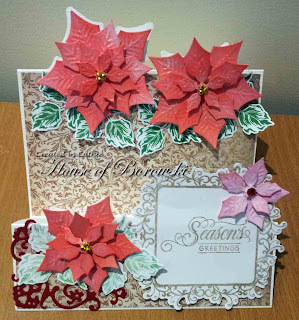 Michelle has created another stunning card this last day for our sponsor.The intricate embossing, deep robust color and beautiful ornament make such an elegant presentation. 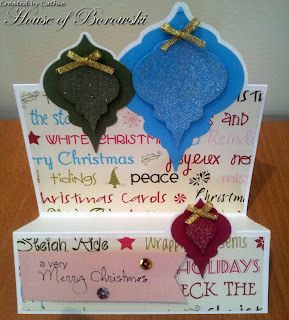 Michelle used dies and stamps from our sponsor. 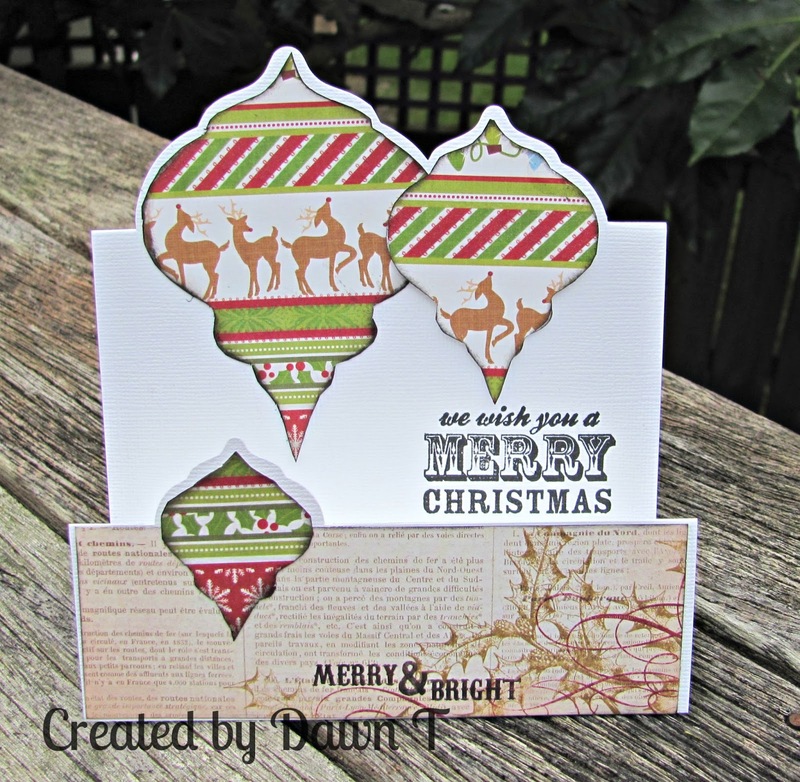 Dawn has created a fanciful card of deer traipsing around the ornament. To me it has a "day gone by" feel to it. Cathie Swirls us around with a modern style and some gorgeous paper. Announcing the addition of a new Diva to Die Cut Divas. Rebecca will begin posting for our September challenge. We wanted you to get to know Rebecca, so we asked her to write a little bit about herself and we're so glad to share her with you. Please welcome Rebecca. Monica delights us with this elegant display of ornaments. Such a gorgeous card. 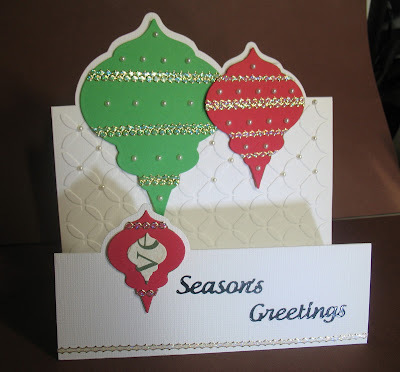 Monica shows us what a bit of embossing paste can do for a card. I never gave it a thought, but you've inspired me. Dawn has caught the strings to my heart with this card. WOW! I really like the sherbet color of the card stock. 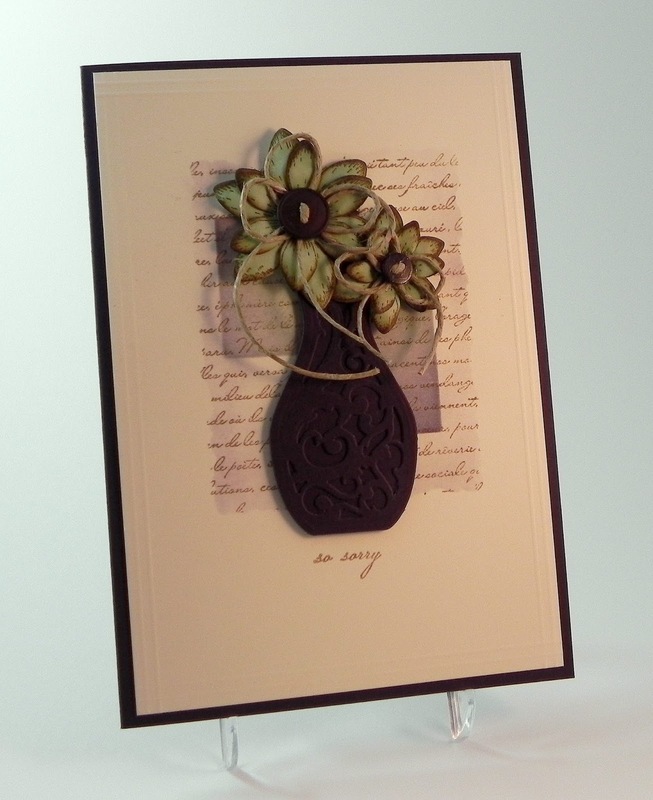 A card made with this color remains soft and comforting. You can check out the different layers to my card at A Bit of This and That. Marsha's got heart, lots of Heart, as we can see in her card. Marsha is showering us with hearts and flowers.The lacy heart is just a gorgeous centerpiece and Marsha shows it off so well. I think I've fallen in love the the Lace Hearts dies. Here today is our Guest Designer this month Lisa Babitz with an amazing card and an amazing tutorial to go with it. 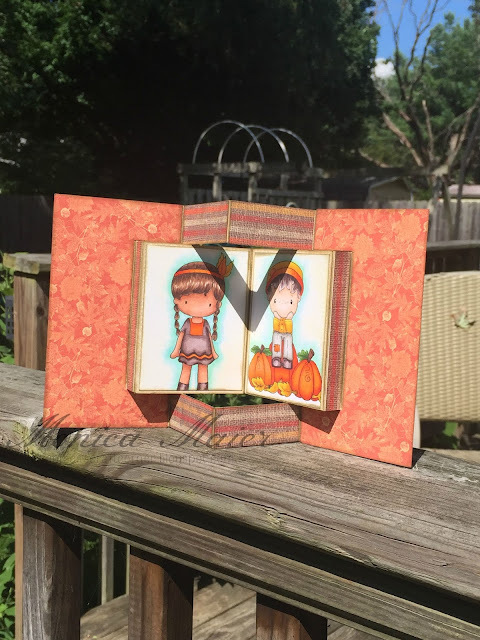 Lisa has created this amazing penny slider card. I've recently made two penny slider/spinner cards, and I must say, I LOVE watching the elements roll across the cards! (Simple pleasures, right?!) So I figured I'd post a tutorial on how to make one!! A penny slider card has an element on the card that spins as it travels across the card. 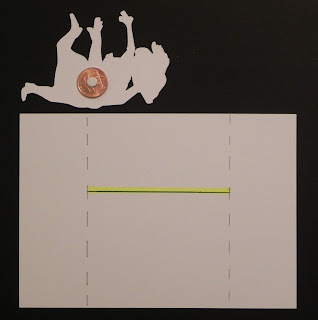 It’s called a penny slider card because the spinning element is mounted on a “sandwich” of two pennies with a pop dot in the center which rolls across the card in a slot or channel that you create on the front of your card. 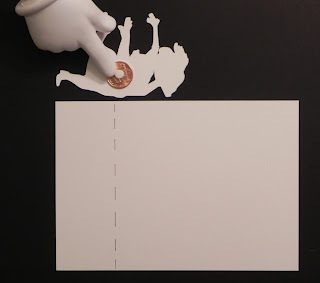 There are three basic parts to a penny slider card: the element that slides/spins, the channel or slot it spins across, and the card front itself. For this step, you need: 2 pennies, a round foam pop dot, glue dots and the thing you want to spin across your card. b. Create half the penny "sandwich" by adhering a round, foam pop dot to the CENTER of one penny. The size of the pop dot does not matter as long as it is smaller than the coin. c. Adhere the image or element to the other side of the penny with glue dots. Try to make sure the penny is centered on the back of your element. d. I'd wait to do this final step until after you create your channel (see section 3), but the final step to create your penny "sandwich" is to attach a second penny to the other side of the pop dot. Once done, the pop dot will be "sandwiched between two pennies, and this "sandwich" will be attached to the back of your image/element. For this step, you need a cutting tool (like scissors, a craft knife, a die or a trimmer) to create the channel/slot. So the yellow highlighted line (below) shows a good length for the channel. Anything shorter is fine; there will just be less room for your spinner to spin. 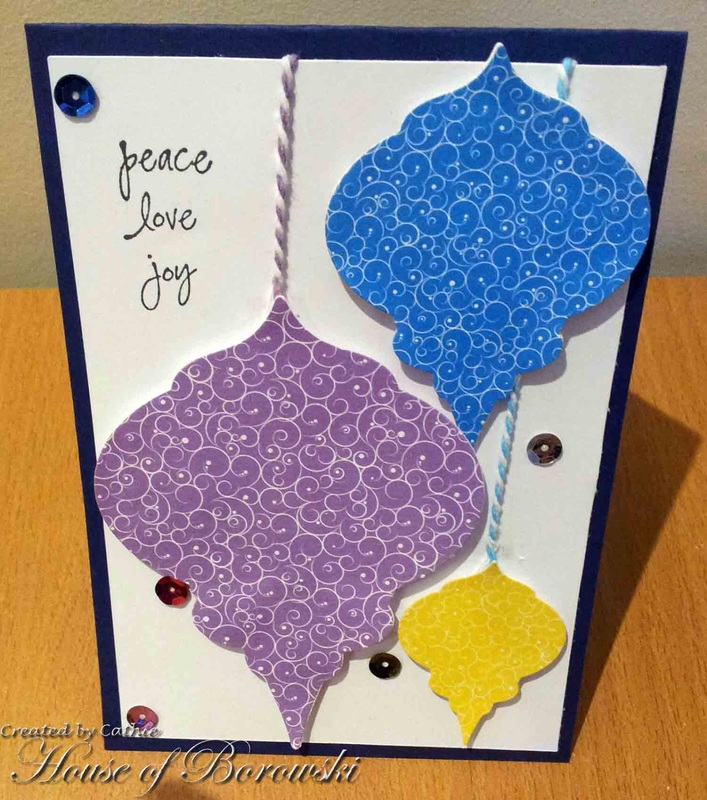 Anything longer will allow the spinning element to hang off the card (which is fine if you are ok with that!). b. To determine how wide to make the channel, look at the pop dot and coins you chose to use. Your slot needs to be just slightly larger than the diameter of the pop dot and smaller than the distance from the edge of your coin to the opposite edge of the pop dot. You want the pop dot to be able to spin freely in the channel, but you don't want the sandwich to fall out of the slot once it is inserted. In the photo above, the line represents the bottom of the channel or slot on which the pop dot will sit/roll. The little arrow shows a good place to cut the top of the channel because it is above the pop dot but below the top of the coin. This is a good width. The penny sandwich can move freely but won't fall out. The slot below is too wide. The penny sandwich can move freely, but the coin is not big enough to stay in the slot. To fix this, you can use a larger coin (or cut a more narrow channel/slot). For this step, you need pop dots or foam tape. a. If you still need to finish the penny sandwich, you can do that now by attaching the second penny to the foam pop dot directly over the first penny. 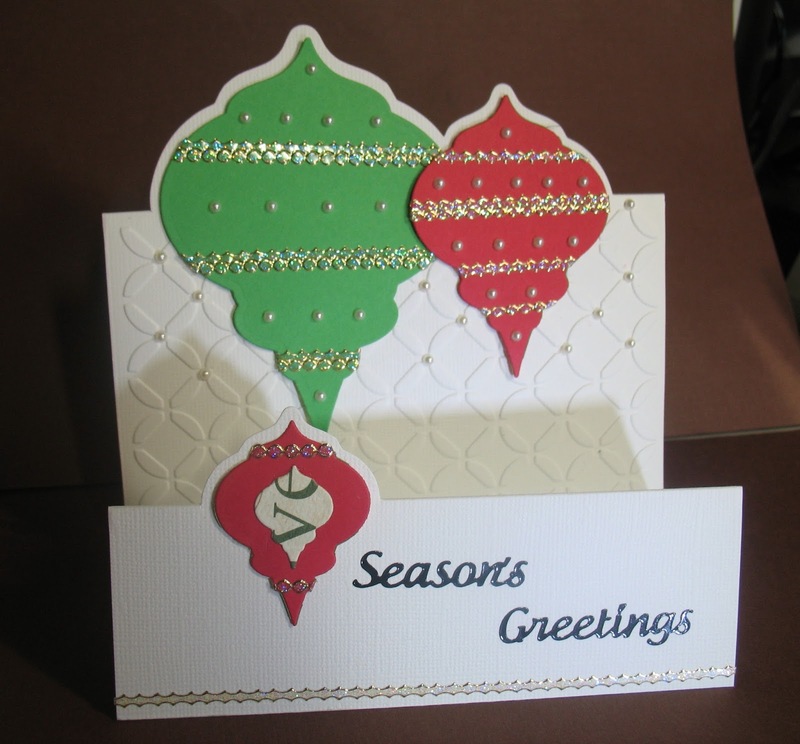 c. Once your card front is complete with the spinner element inserted in the slot, it's time to adhere it to the card base. 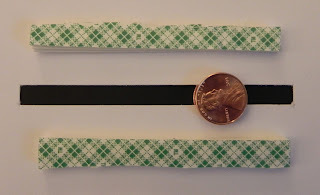 This panel needs to be raised to allow the penny sandwich to roll freely so use pop dots or foam tape. On the back of the card front panel, place the foam tape or pop dots around the channel (without touching the penny) as shown below, and around the edges of the panel (not shown). You may need to double up the foam tape or pop dots to raise the panel enough so the card base does not come in contact with pennies. Attach this panel to your card base, and enjoy! 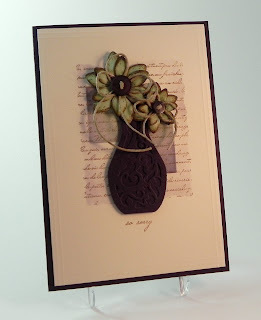 We R Memory Keepers Nesting Dies "Circles"
Lisa Babit is our guest designer for August, 2015. 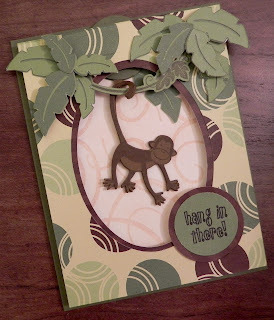 Here are Lisa's Card Examples Aren't these wonderful examples of different styles, playful, whimsical subtle, cute, just a little bit of everything. If you did not see Lisa's interview, please check here. These are just a taste of what Lisa has in store for you tomorrow. Stop by and view her tutorial. I just peeked and OH! You have got to come back tomorrow. A true show-stopper! August welcomes our newest guest designer! How long have you been a papercrafter and when did you start? 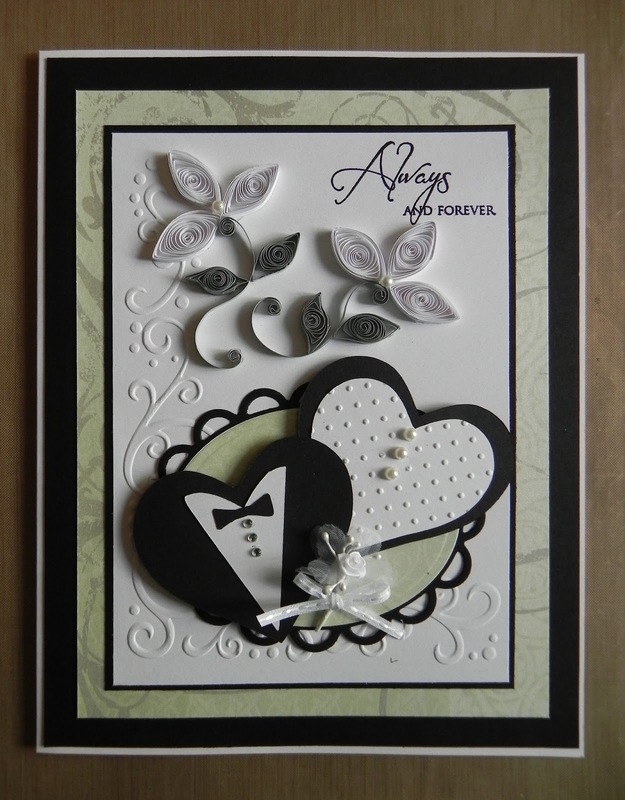 I started scrapbooking in 1999 when my close friend asked me to host a Creative Memories demonstration at my house. I was immediately hooked and began hosting monthly workshops. I began scrapbooks for each of my four children (in the place of baby books) and am still working on them. 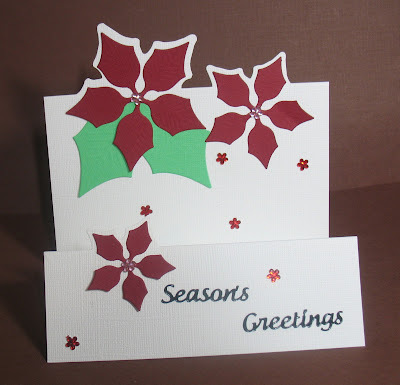 I began stamping and cardmaking more recently (March 2013), and that seems to take up more of my time now. 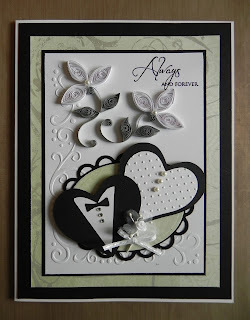 What is your favourite type of papercrafting, card making, scrapbooking, mixed media etc? 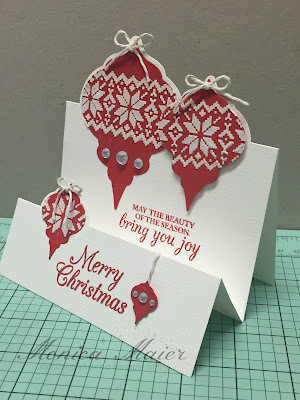 One of the things I love about cardmaking is that each project is completely independent, and creating a card is the perfect opportunity to try new techniques. 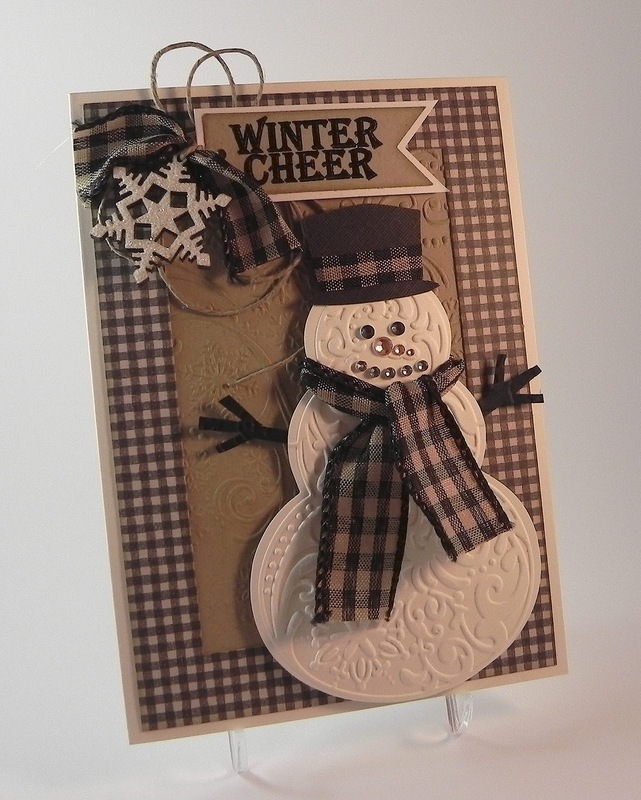 I love watching tutorial videos and looking at other crafters' projects for inspiration. As a result, I don't really have a specific style but try a variety of things. I do tend to like clean lines, layers (with mats, dies and/or embossed panels) and warm colors, but I am still searching for "my style." Do you like to follow sketches, yours or others or do you dive right in? I rarely follow sketches, but when I do I wonder why I don't do it more often! How often do you get to craft? I am a stay-at-home mom with children who are now in college and high school (with tons of afterschool sports and activities). With fewer opportunities to volunteer at their school during the day, my days are pretty free while my afternoons and evenings are crazy busy. When I'm feeling creative, I may be in my craft room every day of the week for hours. And if I'm struggling with ideas, I may not get in there at all in a week. (Of course I have to work around getting stuff done around the house! )Even when I am not actually crafting though, I am always thinking about ideas and stop by my computer quite often to check out what is new and what others are doing. What is your favourite tool(what can’t you create without) and why? This is a hard question to answer. I am addicted to papercrafting tools and supplies and LOVE them all! It's really hard for me to watch a tutorial video and not rush out to get the tools and supplies I need to try it out. If I had to pick my favorite at the moment, I'd have to say it is my MISTI. It has made stamping so much easier which means less "do overs" and being able to focus on the more complicated parts of a project. I sponge and ink on most projects, so I guess that would be considered a favorite. I have a lot of techniques I love, though. What at the moment is your most favourite thing to do on a project? I like inking my edges to give my project a more finished look, and while I am not a huge ribbon fan, I like adding a touch of jute, twine or raffia to my projects as a simple, rustic embellishment. Have you been published or are you on a Design Team, when and where? I am currently on the design team over at Perfectly Rustics. Describe or if possible supply pictures of your crafting area? I have photos of my craft room on my blog (HERE). Thank you for telling us about yourself, we loved getting to know you. Monica present a terrific fun card in book form. 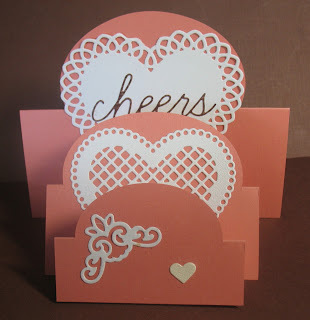 Fabulous colors and she is going to love giving this card to some one. Marsha loves pumpkins and she likes to send pumpkin and harvest cards to her grandkids. I bet she makes pumpkin cookies too... Well, I'm just wondering, mind you. and these continue to be creative and fantastic. Monica takes us on a ride, on a broom, yes, but you can't miss a ride when it comes your way. I love the bright colors and wonderful face on this image. 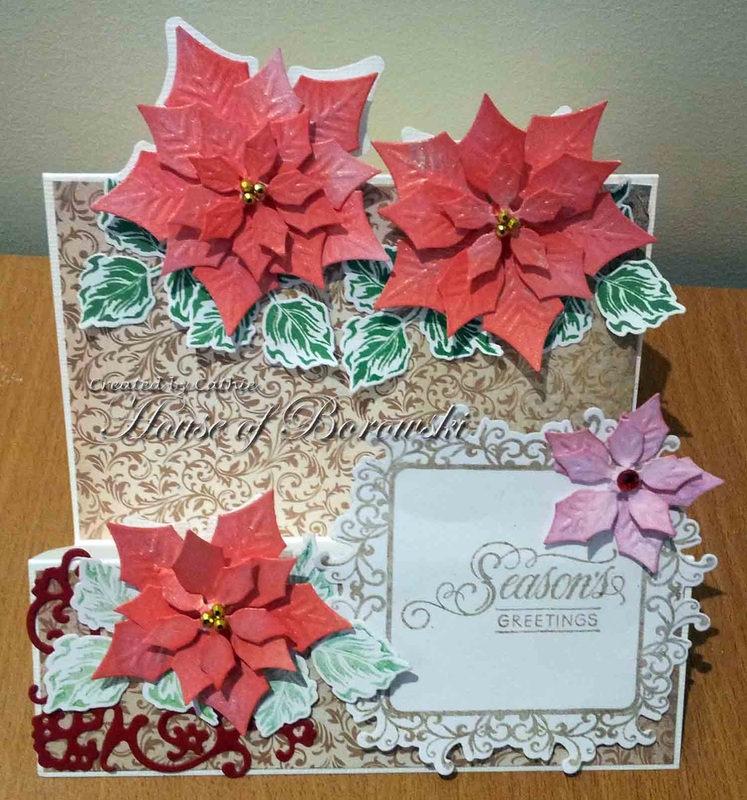 Cathie brings the poinsettia to life. 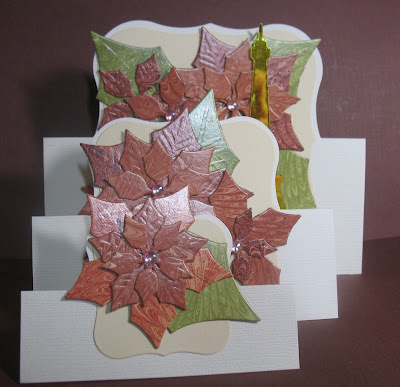 A gorgeous card to show the versatility of the step card and dies. Michelle chose some stamps from Le Crystelle Clothing and Crafts to play with and if you know Michelle, you know her play results in something fabulous, as is this card. Arlene is going crazy this month. I just used the die over and over again to see how it would look built up. Ornaments make the holiday tree the best ever, but they should also be the star on a card. It is so easy to make this card. The ready made step card is perfect. Die cut the Heirloom Ornaments and some bling is all it takes. I couldn't make just one. 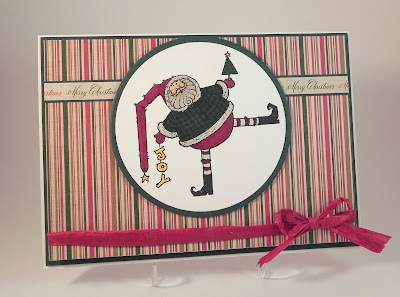 Christmas papers at Le Crystelle Clothing and Cards (I love this patterned paper. Cathie uses a cheerful background of joyful words to coordinate with her ornaments. Lots of fun colors going on! 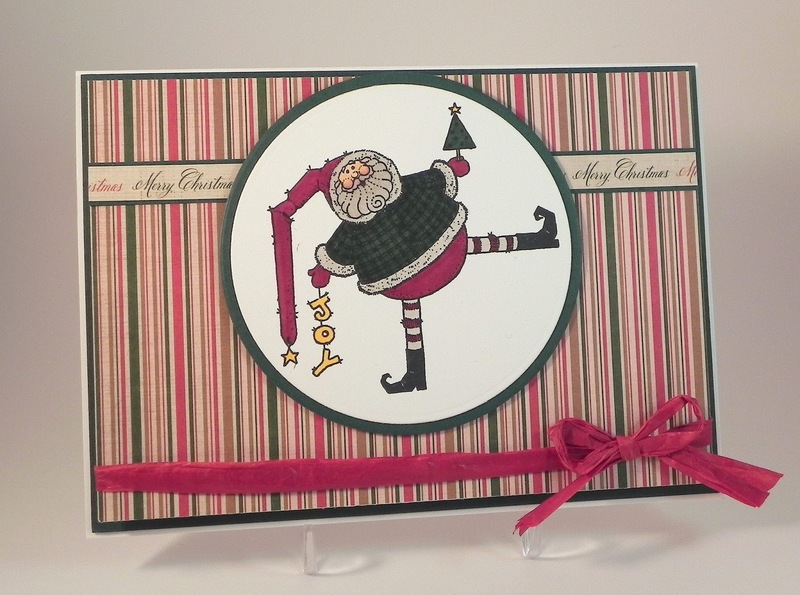 AmyR Stamps Merry and Bright stamp set. 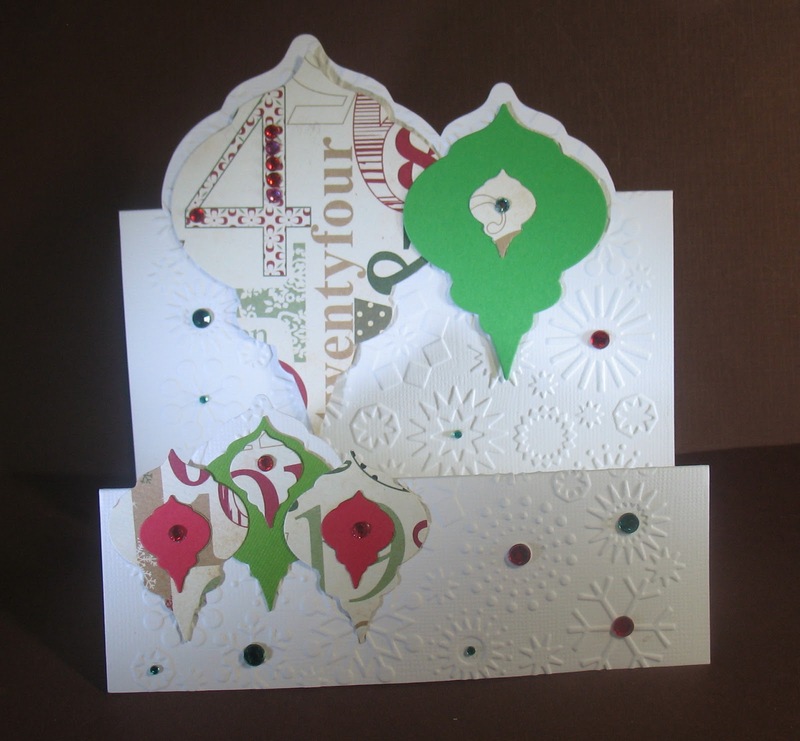 Marsha has created a stunning and elegant card for us and I have fallen in love with it. Don't you love the elegant heart on the back panel? All I can say is WOW!